First World War veteran Captain Gregor Reinhardt used to be a homicide detective in Berlin, but now works somewhat reluctantly for the Abwehr - German military intelligence - in Sarajevo in 1943. Reinhardt is pining for his dead wife and his son missing since Stalingrad, actively dislikes the Nazis, but feels honour-bound to perform his duties. When Marija Vukic, a beautiful film-maker, journalist and socialite, and a fellow Abwehr officer are found murdered, Reinhardt is asked to investigate the case, working with the local police. Yugoslav politics and ethnic tensions are complicated and dangerous, a fractious civil war raging inside a world war, and the local Sarajevo police are neither interested in Reinhardt’s help or in finding the real perpetrator of the murder. It’s clear that a number of Germans share their views. As Reinhardt starts to make progress towards identifying the murderer he becomes increasingly aware that this might be a case that’s best not solved, but since he has little to seemingly to live for he’s prepared to risk everything to discover the truth. 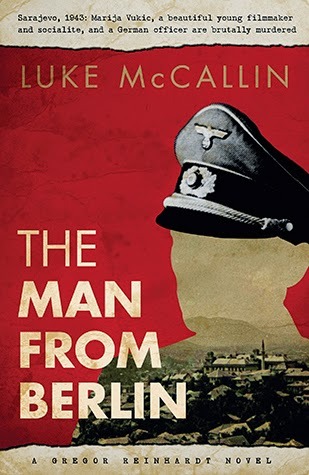 The Man from Berlin is a fairly lengthy, ambitious novel that charts the investigation into a double murder in Sarajevo in 1943 by a disaffected German officer and decorated First World War veteran, Captain Gregor Reinhardt. Reinhardt shares a similar history to Philip Kerr’s Bernie Gunther -- a successful homicide detective in Berlin’s Kripo who has little time for the Nazis and is forced out of the service in the wake of its takeover by the Gestapo. Reinhardt has a very different personality to Gunther, however, being standoffish, reflexive, somewhat passive and prone to self-loathing. Now working in the Abwehr he’s keeping his head low and serving out time. However, the investigation into the deaths of a fellow officer and a feisty femme fatale awaken his detective skills and his conscience. The great strengths of the story are the characterisation, and in particular Reinhardt, and the plot, with a number of compelling sub-plots, tension points, and twists. McCallin nicely portrays the tensions within the German forces and between Axis allies, and maps out the complicated terrain of Yugoslav politics and ethnic rivalries. The result is a story that has depth and resonance, as well as good sense of time and place, though occasionally the pace slows to crawl, the result of too much description and explication. Nonetheless, The Man From Berlin is a very good read, full of historical detail, with a fascinating backdrop and interesting murder case. I hope to read this book soonish. My husband just gave me his copy and it fits in nicely with my recent reading. Looking forward to it. Excellent review. Hopefully you'll enjoy it, Tracy. 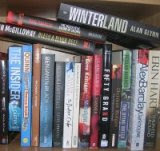 Very good for a debut book, I thought.